Here's my take on chicken tortilla soup. The base is a quick stock made from the bones of leftover grilled chicken, and I use some canned ingredients to make the prep a snap. 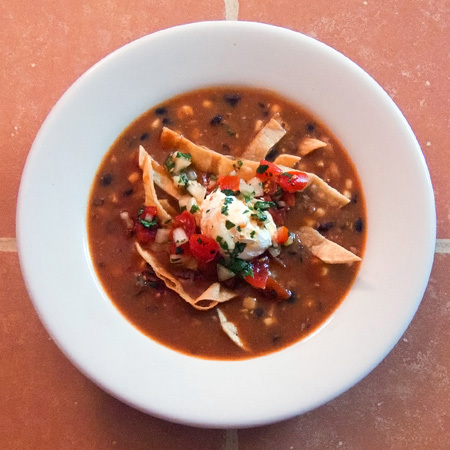 If you like chicken tortilla soup, I highly recommend that you give this a try. It's a spicy, rich, and slightly smoky twist on the traditional version. Remove the chicken from the bones (reserve the bones), chop to 1/2", cover and refrigerate. Combine the water, reserved chicken bones, onion, carrot, celery, bay leaf, and peppercorns in a large stock pot. Bring to boil, reduce to simmer, and cook uncovered for two hours. Strain the stock and set aside. Heat the oil in a large pot over medium heat. Add the chicken, garlic and hot sauce, and cook two minutes, stirring frequently. Add 8 cups of the stock, tomatoes and chiles, Ro*Tel sauce, beans, and corn to the pot. Bring to boil, reduce to simmer, and cook uncovered for five minutes. Serve topped with fried tortilla strips, sour cream and pico de gallo. You always have the most unique and delicious twists on recipes. This is no exception. I love finding new uses for my smoked chicken broth - this is perfect. I just love your creativity. Simple recipes with simple ingredients and tons of flavor. I look forward to your posts! John I assume that the reserved chicken bones go in the water to boil for two hours as well? Anonymous - Yes, the bones go in the water for the stock. I've modified the recipe. Thanks for the heads-up. Looks great. I am going to try this real soon. Thanks to all of you for your very kind and gracious comments.